the best machines, the best prices and the best service! Click here to see a video of the Landforce multi-use waste shredder and recycling machine in action. Chest height feed hopper for safer material loading. The higher than conventional loading height prevents the operator from leaning into the machine, hence helping to protect the upper body. Reversible hydraulic feed roller with a stress control unit back-up is fitted to prevent overload of the unit. Safety bar instantly stops the in-feed roller - highIy effective and reliable. Dual forward & reverse roller feed buttons on both sides of the machine, increasing safety and ease of use for the operator. Heavy duty full depth safety curtain, to maximise operator safety. Push button controls in the Locking & Control box. Generous in-feed hopper - 800mm wide x 700mm high. Feed capacity roller will rise up to 125mm in height and is 800mm wide. This is designed to allow bulky green waste material to feed in. The machine is hydraulically powered, so there are no belts to wear or slacken. The engine does not have to start under load. Large capacity (180 litre) hydraulic oil tank, to keep oil temperature low, thus removing the need for an oil cooler. Powerful Kubota V1505T Turbo Diesel 4 cylinder water-cooled engine. Maximum power: 45HP (33kW); 45 litre diesel tank. Twin axles, to give even weight distribution, so the machine is not reliant on a jockey wheel at the front, when being used separate from a vehicle in a static situation. Heavy duty cast, locking towing head, with ribbed jockey wheel post and heavy-duty wheel. Size of shredded material can be quickly changed by addition or removal of screen to one of many different hole sizes (machine supplied with one screen as standard). Road emergency tool kit, comprising 2 ton trolley jack, wheel brace and warning triangle. With the emphasis on sustainability and due to increasing restrictions by Local Authorities on the disposal of green and wood waste into landfill, our commercial materials recycling machine is the ideal solution. This waste shredder and recycling machine can produce a reusable material, saving money and helping the environment. The multi-use shredder is ideal for Local Authorities, building & construction companies and contractors who need to shred material and reduce volume. This machine has a very high work-rate and is strong and powerful enough to take ALL demanding situations without complaint! The wide loading hopper allows the feeding of waste up to 100mm diameter and the shredded material can be directed via the elevator into a truck or container. 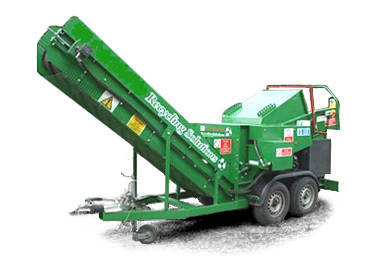 The waste shredder and recycling machine is highly mobile and can be towed behind a non-HGV vehicle. Skips are filled far more efficiently, with a potentially reusable product that will only cost the transport charge for removal, or to produce a waste product with a saleable value. The Hardmet Landforce waste shredder and recycling machine will shred materials from construction sites, as well as smaller building sites - plywood; chipboard; timber; fencing; pallet wood; tile battens with nails; rigid waste plastics such as window frames, guttering and cladding. Cardboard, glass, etc can be reduced by as much as 8:1 by volume, whilst rigid waste plastics - such as old guttering, cladding, etc - can be reduced in size by as much as 10:1. The machine will operate equally well, for landscaping and amenity use, as a green waste shredder - shredded tree cuttings or hedge trimmings can be used for ground cover on shrub beds and borders. Click here to request more information on the Commercial Materials Recycling Machine.